Why do I have to visit this page? When you visit this page, we will isolate your computer from our marketing statistics. We do not want to include your website visits the same as a customers’ visit. By isolating your computer, it will help us better understand our customers’ behaviour online. We do not want website visits by SHEilds staff to be included as it distorts our marketing statistics (you behave differently than our customers do online). Simply put, we are improving our systems and your co-operation, i.e. visiting this page, (although it may seem trivial) is a fantastic contribution. 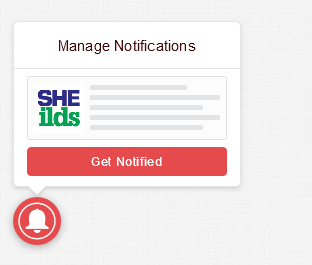 If you haven’t already, please ensure you have agreed to allow notifications from the SHEilds website when the message pops up. Please click the ‘Please Do’ or ‘Allow Notifications’ when prompted. If you have declined notifications already, don’t worry. Just look for the ‘bell inside a circle’ on the bottom left of the page and hover over it to see your current subscirption status. If you’re already subscribed, you don’t have to do anything else. If you are not subscribed, then click the ‘Get Notified’ button in red. Once you have accepted notifications – You may be prompted by your browser a second time to allow notifications – obviously accept them. This behaviour is different depending on your web browser. You can unsubscribe and re-subscribe at any point, but as an employee we ideally need you all to be permanently subscribed to notifications.